ANNIHILATOR Premiere Video For "Suicide Society"
Suicide Society, the new studio album from thrashers ANNIHILATOR, will be released on September 18th via UDR Music worldwide and now the band has released the video for the title track to the album. Check out the video for "Suicide Society" on KNAC.COM right HERE. As usual, guitar wizard Jeff Waters handles all songwriting duties, plays all guitar & bass, engineers, produces, mixes and masters Suicide Society, and Waters is also back commanding lead vocal duties, as he did on the King Of The Kill (1994), Refresh The Demon (1996), Remains (1997) and other ANNIHILATOR albums over the years. Waters later elaborated on his initial statement: "Those who expect a King Of The Kill vocal are in for something interesting! I intentionally tried to avoid the cliché metal vocal/rock stuff I did then (but didn't realize I was doing it then!) and weed out the bad in my voice and style; try to find the good stuff and only do those things! I guess you will be the judge but I am stoked!" 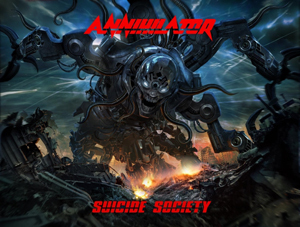 With Suicide Society, ANNIHILATOR goes headfirst into some of the most technically perfect, crisp, and crushingly taut, riffage Waters has ever produced. Although Waters’ vocals keep traces of stylings from his King Of The Kill album, they now evoke a surprising blend of legends such as Staley, Osbourne, Hetfield and Mustaine. This, in a twisted way, mirrors Waters’ signature blend of riffing, drums grooves and bass; all drawing from multiple sources and genres. Waters has built a worldwide reputation as being a premier guitarist and songwriter; the conciseness and arrangement of “Creepin’ Again” is both an air-guitarist’s dream and a sharp reminder of this. The gloriously-brutal thrash of “My Revenge” calls up a vintage of ’85 with the technical chops of 2015. The neo-classic title track defiantly expresses anger at the state of world affairs, while offering up hope in closing. With the multi-layered power of the anthem “Snap”, Waters illustrates the diversity of ANNIHILATOR’s sound, without sacrificing one decibel of attack.